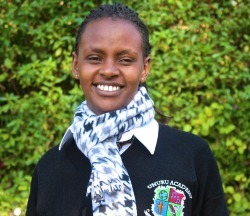 Josiphine is a bright and dedicated student of the Uhuru Academy 2019 graduating class. She is one of seven siblings and lives with both parents near Maai Mahui. Josiphine is from a very traditional tribe known as the Masaai. Being extremely rich in culture, she is proud of her heritage and customs of rearing cattle, goat, and sheep A close friend has motivated her to pursue a career becoming a Kenyan news broadcaster. During freetime, Josiphine enjoys reading storybooks and playing netball. Click here to sponsor a student like Josiphine.